I love the natural world, the thing is…sometimes I wish it was inside. It’s the forms that I love, but I could do without the bugs and snakes. I think that is why I so love the work of Antoni Gaudi. His forms are so obviously of nature. 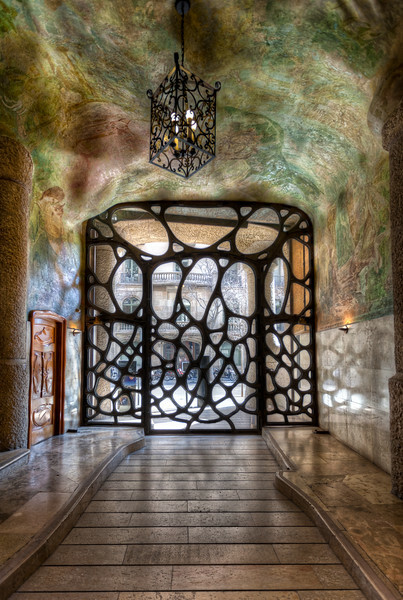 This entryway in La Pedrera looks (to me) like a cave, the door looks like a tree or a mass of vine at its entrance, the walkway could easily be a spring running through the cave. With sensibilities such as this in architecture one wonders if you would ever need to go outdoors (just kidding). Posted in Barcelona, HDR Photography, Spain, Travel, UNESCO World Heritage and tagged Antoni Gaudí, architecture, Barcelona, doors, Spain by Bri Duncan.